The techniques for in vitro cultivation of AM fungi on excised roots (Declerck, Fortin and Strullu, 2005) and autotrophic plants (HAM-P and AM-P)(Voets et al., 2005; Dupré de Boulois et al., 2006) are used since many years at the CEntre of Study on AM Mononexics (CESAMM) as useful tools to investigate plant-fungus associations. These systems can be used for a wide array of research topics. Indeed, they offer unique advantages in genetics, cell biology, biodiversity and physiological investigations of AM fungi and their hosts. 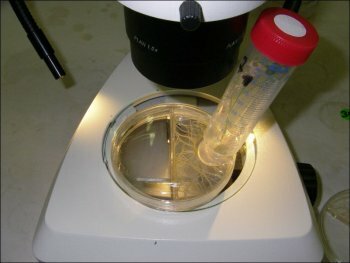 Non-destructive microscopic observations, reliable cell physiology studies, clean biochemical and molecular analyses, highly controlled interaction studies with other micro-organisms and the potential to develop reliable in vitro mycorrhization of micro-propagated plants at an industrial scale, are amongst the applications permitted by these techniques. The proposed training will allow you to master both the root organ cultivation technique (i.e. 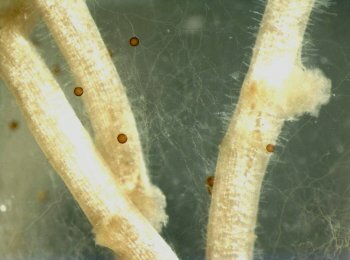 the in vitro culture of an AM fungi with excised roots) and the more recent autotrophic plant in vitro mycorrhization technique. This training is addressed to scientists, technicians and industrials who aim at developing their research potential and the production of contaminant free AM inoculum. Declerck S., Strullu D.G and Fortin J.A. (2005). In vitro culture of mycorrhizas. Heidelberg, Springer-Verlag. 386 p.
Dupré de Boulois, H., Voets, L., Delvaux, B., Jakobsen, I., Declerck, S., 2006. Transport of radiocaesium by arbuscular mycorrhizal fungi to Medicago truncatula under in vitro conditions. Environmental Microbiology 8(11): 1926-1934. Voets, L., Dupré de Boulois, H., Renard, L., Strullu, D.G., Declerck, S., 2005. Development of an autotrophic culture system for the in vitro mycorrhization of potato plantlets. FEMS Microbiology Letters 248: 111-118.